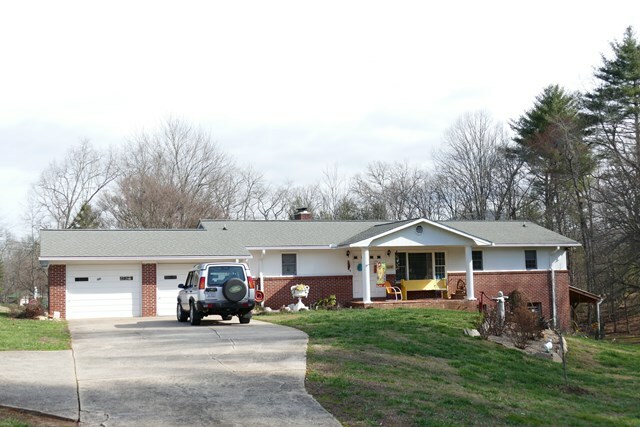 Stunning Brick Ranch Home in Otto/Franklin NC. This is a beautifully kept property consisting of 3.3 acres of level land. Garden spots, Fenced areas for your pets, and it has a new 24x30 outbuilding that is powered and has two bays and doors for all your hobbies etc. The home is in good condition, good roof, new flooring and tons of space for all your needs. You can have horses, chickens whatever! Two bedrooms on the main, with the laundry on the main make this a true SINGLE LEVEL LIVING HOME. This home has a fully equipped In-Law suite down below with a gas log fireplace and a 3rd bedroom along with a very large living room. The lower level has a nice covered porch for access to the level yard. With both inside/outside access to this lower level, it can be used for RENTAL, or and In-Law suite as it has a full kitchen/Bath etc. The home also has a good sized double car garage attached with access to the lower level living quarters for your convenience. You have to see this one... Paved to the door, plenty of parking, great neighborhood! Call today to see this home in person!